Just Talk examines the often overlooked role of gossip and rumor in creating power in small Melanesian communities. The Kwanga of the East Sepik Province of Papua, New Guinea think that malicious gossip is almost as dangerous as sorcery. They spend hours in community meetings, looking into rumors about sorcery, adultery, and other sources of trouble. 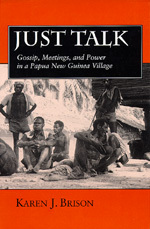 To understand how "talk" can create and ultimately destroy the position of Melanesian leaders, Karen Brison follows discussions of particular situations over time and suggests that gossip and rumor are just as central to shaping and shifting power relations as are the public meetings which are more often studied. Kwanga community leaders build reputations by spreading rumors and dropping hints that they are confidants of sorcerers. But ultimately, the same men who build reputations through gossip and innuendo find themselves victimized in turn by malicious gossip. Just Talk suggests that our understanding of both Melanesian leadership and the power of words to construct social reality is greatly enhanced by attention to gossip and rumor: words are dangerous weapons that can have consequences the original speaker neither anticipated nor desired. Karen J. Brison is a Visiting Assistant Professor in the Department of Anthropology at Washington University.